Is anyone surprised? Duke Energy says it will appeal the Roy Cooper Administration’s order to move all its coal ash to lined landfills to keep it from seeping into groundwater. Duke said last week that it will file an administrative appeal of the Department of Environmental Quality’s (DEQ) order that it dig up all the coal ash at six coal-fired power plants that had not been covered by previous cleanup directives. Duke sought to defend its appeal by pointing to DEQ’s controversial decision to classify some of the pits as “low risk” when industry favorite Donald van der Vaart was former Gov. Pat McCrory’s DEQ Secretary. Van der Vaart’s decision was criticized at the time as a poorly supported giveaway to a politically favored corporation. 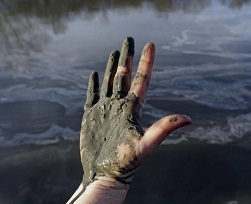 Holleman pointed out that Duke’s coal ash pits “have been polluting our water for decades and will continue to do so for centuries,” and that all similar facilities in Virginia and South Carolina are also now required to excavate and relocate their ash from unlined pits to securely located, lined landfills. Eight Duke impoundments were covered by previous removal rulings. DEQ Secretary Michael Regan said that the new order was justified by scientific evaluation of the pollution control value of removal and relocation. DEQ continues to stand by its complete cleanup order following Duke’s appeal announcement, and NCLCV and its members fully support protecting our people and our drinking water from coal ash pollution. Click here to thank Gov. Cooper for standing up for us.